If you've been following my cooking adventures, you must have realised how much I love desserts! Desserts of all kinds! Even if I have mentioned that I should be cooking more main courses lately, I haven't really had the chance to! But as you already know it, a Crème Brûlée is no big task! All done in a jiffy, its the perfect dessert to prepare ahead of time! One would be surprised at how easy and simple this recipe is to make and yet it tastes sophistically delicious and scrumptious! 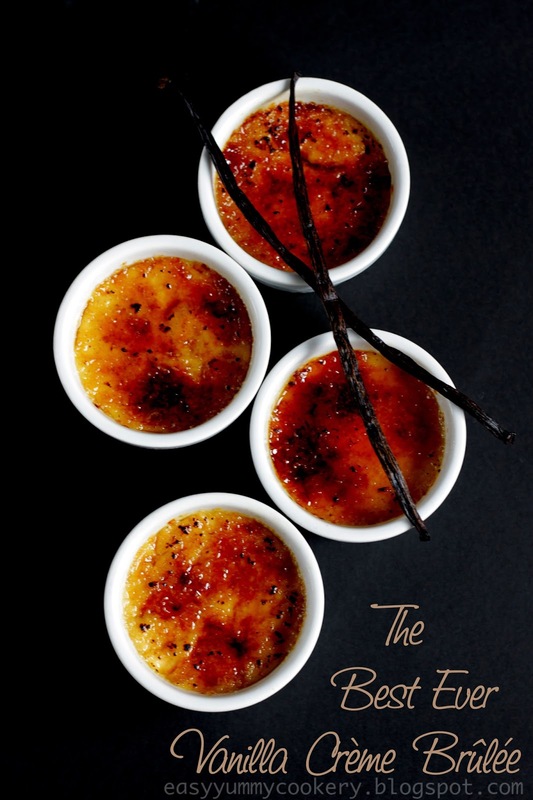 Ever since I've made this version of Crème Brûlée, I've never looked back at the classic recipe! Its lightly sweetened velvety texture indeed makes it a recipe to keep! I must confess though, that my best friend, Z, - who's a sugar freak - admitted that she would have liked it more sweetened! I don't actually blame her, it's the first time she has had Crème Brûlée and she has a big sweet tooth for that matter!! If you think Crème Brûlées are complicated to make, then think again! 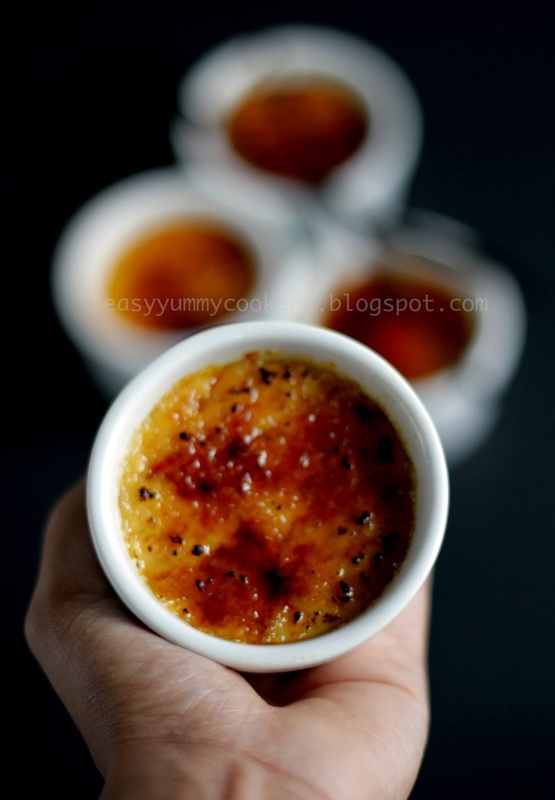 You can make this light, velvety and scrumptious Crème Brûlée in your own kitchen!! But she gave me her most honest revelation!! Those are the exact words that she used to describe this Crème Brûlée: Soft, Not Too Sweet (What did I say eh!!?? ), Light and Melt in The Mouth! Hence Dear Readers, if you're feeling creamy and velvety, check right back here and treat everyone with some mouth-watering Crème Brûlées! Oh, one last quick note!! Let me also add that I find quite a lot of people complaining about the eggy taste of Crème Brûlées; which happens to be the reason why they refrain from diving into this heavenly dessert! Rest assured! This recipe is a very odd but delightful exception to the eggy rule! 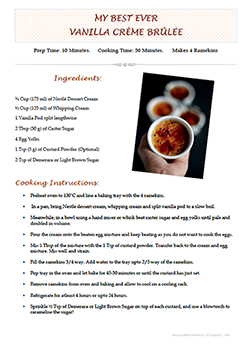 Click Here for a Printable Recipe Card ! Preheat oven to 130˚C. Line a deep enough baking tray with 4 ramekins. In a pan, bring the Nestle Dessert Cream, whipping cream and vanilla pod to a slow boil. Meanwhile, in a bowl using a hand mixer or whisk beat the caster sugar and egg yolks until pale and double in volume. Pour the cream onto the beaten egg mixture and keep beating as you do not want to cook the eggs. Mix 1 Tbsp of this mixture with the 1 Tsp of custard powder. Transfer back to the cream and egg mixture. Mix well and strain. Fill the ramekins 3/4 way. Add water to the tray upto 2/3 way of the ramekins. Pop tray in the oven and let bake for 45-50 minutes or until the custard has just set. Remove ramekins from the oven and baking tray and allow to cool on a cooling rack. Refrigerate for atleast 4 hours and upto 24 hours. 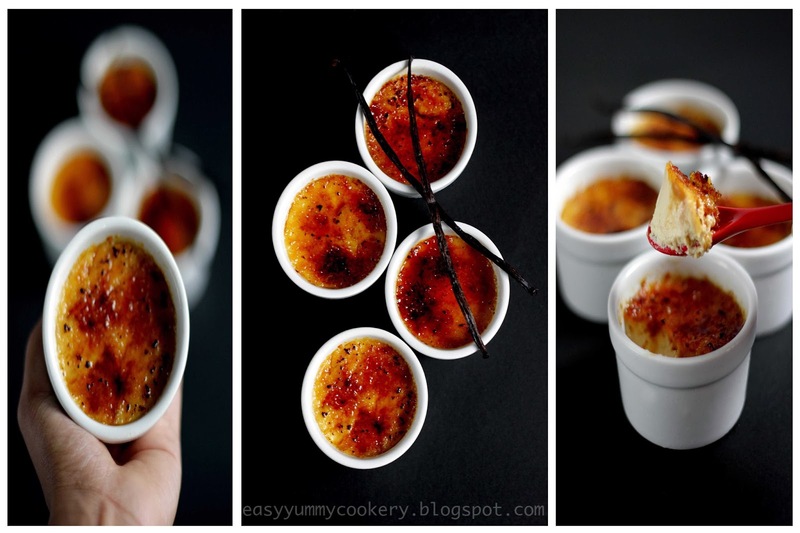 Sprinkle 1/2 Tsp of Demerara or light brown sugar on top of each ramekin, and use a blowtorch to caramelise the sugar. 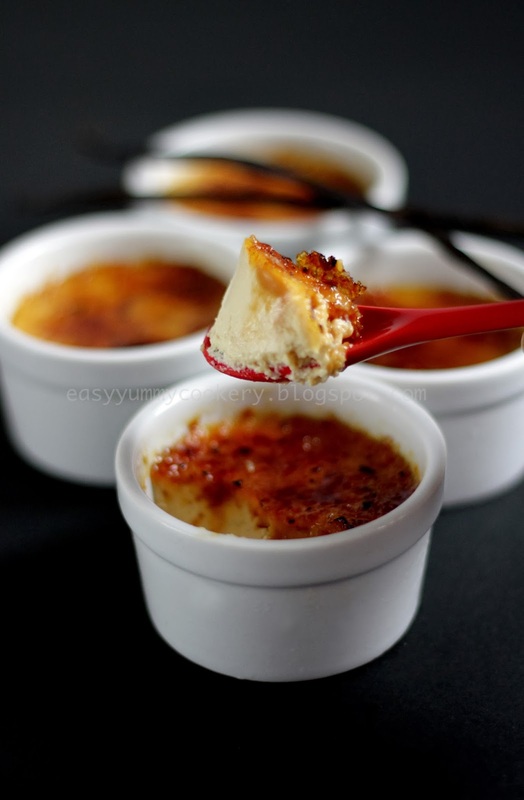 Enjoy this rich homemade version of Crème Brûlée! Thank you Nisha! It was indeed creamy! looks to die for.... I can't wait to try it. Do try it Briony! You will love it! Finally, I made it. It took me a day to reach to creme brulee, but, I made it. But anw, everyone should go for a try, because it's easy and it's a dessert that is made for people not really good at baking and all, but yet, you will have awesome praises at the end of the day.